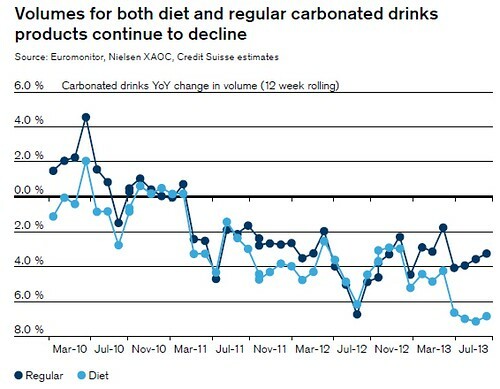 New research from Credit Suisse suggests sugar consumption is approaching a significant crossroads, due to ever more compelling research linking excessive sweet drink and food to rising global obesity trends. Efforts to reduce sugar consumption by governments could have a serious impact on business across the sugar supply chain from sugar producers, refiners and food and drink manufacturers. Why are we talking about this now? I thought the link between too much sugar and rotten teeth has been known for ages? Its not just dental problems. While medical research is yet to prove conclusively that sugar is the leading cause of obesity, diabetes type II and metabolic syndrome, the balance of recent medical research studies are converging on this conclusion. So what are governments doing about it? Who are the biggest consumers of sugar? The consumption of added sugar (sugar not contained in natural products like fruit or milk) or high-fructose corn syrup (HFCS) has increased dramatically over the last few decades, yet consumption varies considerably from country to country. At the top, we find the USA, Brazil, Argentina, Australia and Mexico, all at more than double the world average; ranging from 40 teaspoons for the USA to 35 for Mexico. At the other end, we find China with 7 teaspoons. Growth in demand for sugar is strongest in emerging economies, particularly South America and Asia. No I meant who are the ‘biggest’ consumers of sugar? Oh I see. Well there a lot of them, half a billion adults worldwide are classified as obese. Although sugar isn’t the only offender it just so happens that Mexico and the US are the largest with over 30% of adults classified as obese. So this global sugar rush must mean prices are high? Er no. 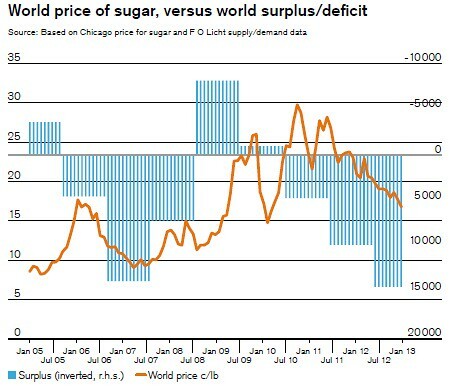 Since peaking in 2010 at around 30 cents per lb sugar prices fell by a third to around 18-20 cents. The sugar market is very sensitive to movements in global supply, particularly from Brazil as it supplies around half of the ‘global’ market. Since 2010 increases in Brazilian sugar cane production have resulted in a large supply surplus on the global market putting downward pressure on prices. What is the outlook for sugar demand? Global sugar demand has grown consistently at around 2% per annum over the past ten years. Despite rising health concerns consensus forecasts point to demand continuing to grow at this level – albeit with slower growth in developed economies and stronger growth in less developed economies. Credit Suisse is more pessimistic (or optimistic from a health point of view) suggesting that the most likely outcome over the next 5–10 years will be a significant reduction in sugar consumption. Indeed there is some evidence to suggest that consumers are heeding the warnings over sugary drinks with lower consumption of carbonated drinks. In the longer term food and drink manufacturers are unlikely to suffer too much. By then they would probably have established a new line of “healthier” alternatives.